Apologies for the late posting of the mystery object answer, I’m at a conference in Edinburgh and I didn’t get a chance to write until now. I thought it might be an easy one, but I was hoping to catch a few people out, which use exactly what happened. 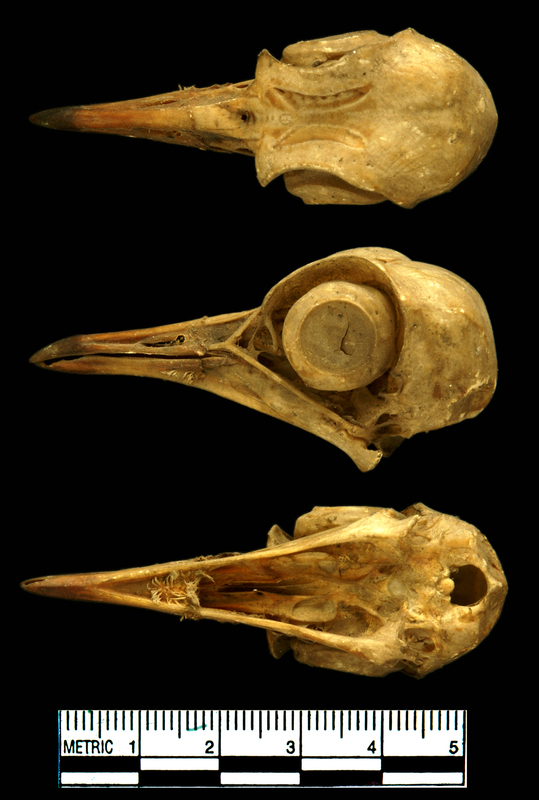 This skull is a nice example of morphological convergence – looking a lot like a Pigeon skull, but it is actually the skull of a Northern Lapwing Vanellus vanellus (Linneaus, 1758). I’ve written about these birds before, so I’ll keep this answer short, but I think it’s worth mentioning the small scars from the salt glands on the top of the head – which are one of easiest ways of differentiating this skull from that of a Pigeon. These salt glands are normally associated with marine birds (which is also something I’ve talked about before), but Lapwings aren’t really marine. So why do they have them? As it turns out, that’s not an easy question to answer. The obvious answer would be that the salt glands are a vestigial artefact of the Lapwing’s recent ancestry amongst the shore-foraging Plovers. However, salt glands are quite variable structures that can increase in size if a bird is exposed to more saline conditions. This flexibility (and the relative metabolic expense of maintaining them) suggests that they wouldn’t be a difficult structure to lose, or at least reduce to the point where they don’t leave a scar, over a few generations of disuse. There are certainly other Charadriiformes (like the Snipe) that don’t have salt gland scars, so why do the Lapwings? Perhaps it’s just that the sodium secretion function is still of use in some habitats during their migration. If you have any thoughts on this please feel free to put them below – it’s a bit of a puzzle for my conference addled mind… More about salt glands here if you’re interested [pdf]. Yes, I got it right! 😉 Actually Northern Lapwings are very common over here in the Netherlands. It is one of our most common waders. they live on grassland over here and although most grassland is not salt, the places where they spend the winter in large flocks over here are or just to be: the Wadden (http://en.wikipedia.org/wiki/Wadden_Sea) and the IJsselmeer ( http://en.wikipedia.org/wiki/IJsselmeer ). As far as I know these two places are the main places Lapwings from all over Northern Europe stay in winter. That might explain the large salt glands. That makes sense. I didn’t think to look for distribution maps outside the UK, it goes to show how easy it is to only see a piece of the bigger picture and make assumptions about the whole. Regarding ther salt glands: Well, they feed on mud-flats, a salty environment, as well as cultivated land. I wonder if in the past mud-flats were their predominant feeding ground. Their move to cultivated land can only be recent, in evolutionary time-scales, so they are still salt-adapted. Another good observation – it can be easy to think of the UK as being a predominantly open habitat, but it wasn’t all that long ago that forests dominated and it seems reasonable to consider that it was the salt flats and marginal saline habitats that would have offered the kind of environment that would suit Lapwings.